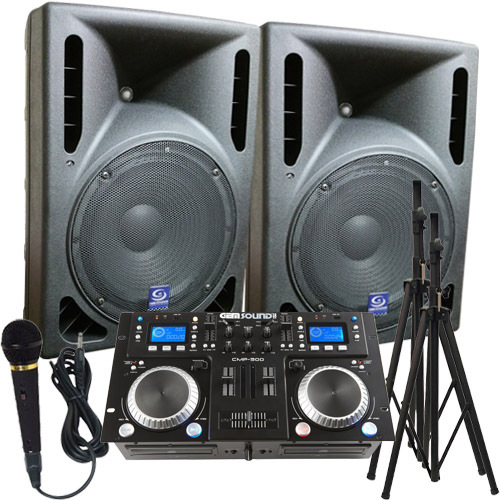 This DJ package includes Gem Sound's killer CMP-500 Professional Mixer & CD/MP3 player / controller paired with Gem Sound's PXA115T-USB 15" Powered Dj Speaker, along with a microphone. Rounding it out is cables and two Speaker Stands. All you need to DJ at Weddings, Reunions, Partys, or even School Dances! The Gem Sound PXA115T-USB has an 15" woofer, high compression driver and 1000 watts of peak power. 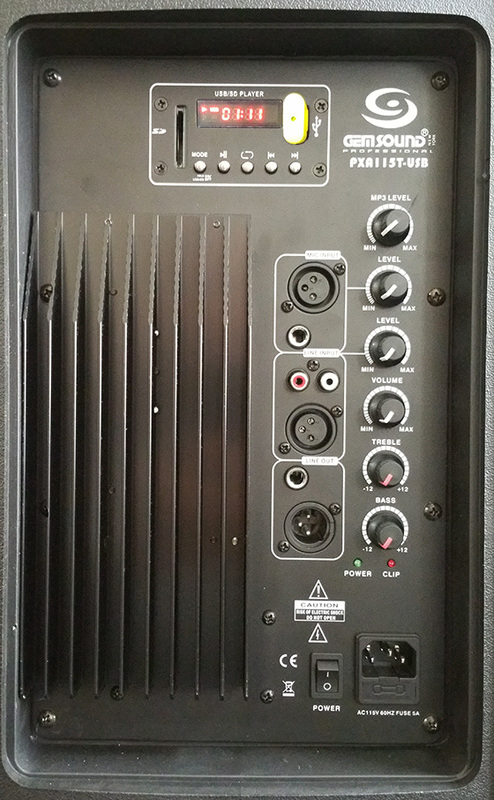 The built in control panel has USB/SD slots, bass and treble controls and 1/4" and XLR mic inputs with gain control. It also has 1/4" and XLR line outs and is switchable from 110/230v. Easy carry, sturdy handle built-in on one side. Everything you need in one rackmount unit. Gem Sound's CMP-500 is a Dual CD MP3 USB Player & music mixer in a single rackmount unit and packed with performance features. It combines a Gemsound DJ mixer with a dual CD player. Features include Rotary tone controls ( high / mid / low ), CD, Mic and line inputs, headphone jack, Loop and reloop ( in & out ), 2 Channel RCA master output, 2 channel REC output, Photo Interrupter jog wheel and CUE on /off switch for each channel. Simply plug this unit into your home stereo or a set of powered speakers and your complete system is ready to go.